The Focus for Netflix in 2018 and 2019 is to grow original content and attract new subscribers, which they seem to accomplish on both fronts at the cost of operating margins in Q4. When the earnings call for Q3 was released Netflix (NASDAQ:NFLX) announced that Q4 would have a lower margin than expected due to the cyclical nature of content licenses and expenses related to releasing new original content on their platform. Q4 showed an operating profit of 5.2% while the annual average for 2018 is 10%, Q4 2017 was 7.5% for reference, net income for the quarter was $134 million from $4.1 in revenue. Netflix grew their paid subscribers by 26% annually to 139 million with much of that growth coming internationally, there are 58 million US and 81 million international subscribers. What should be of note is that US subscribers account for over 6 times more profit for the company than the rest of the world. Netflix does not hedge against currencies formally, and therefore is at risk for adverse conversion rates, however, because they operate in so many countries much of this risk is spread out and reported as international income and not on a country by country basis negating much of the impact. 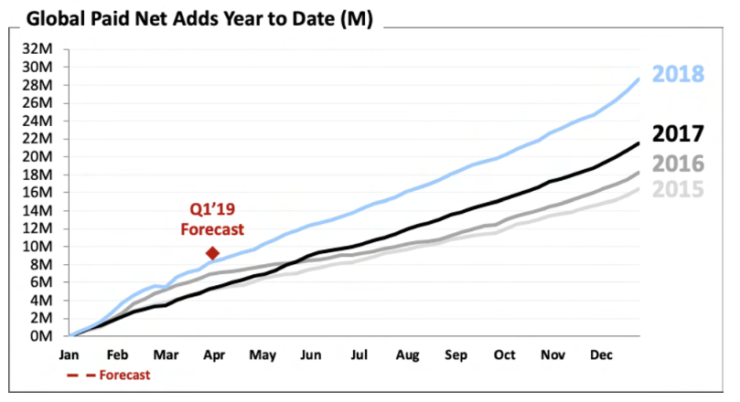 In Q1 2019 Netflix announced a price increase in the United States, Netflix increases prices across different regions at different times to stagger the cost and not see big shocks in subscriber adds and drops, in Q4 they increased prices for Japan and Canada for reference. The difference is that the United States accounts for 58 million subscribers and most of their profit, so it makes the biggest impact on revenue. The price increase is between $1-$2 depending on the plan and will be rolled out immediately to new subscribers and before the quarter ends for current subscribers. As we reported before, Spence Neumann previous CFO of Activision Blizzard (NASDAQ:ATVI) was introduced as CFO after the reporting quarter ended and did not have any impact on financials but will in the coming year. He is replacing David Wells who announced he would be stepping down in August once a replacement was found. In after-hours trading Netflix stock is down 4%. Netflix Testing “Ultra” Tier – Bad News for Current Subscribers?